Welcome to the website of aTLC, the Alliance for Transforming the Lives of Children. aTLC is dedicated to supporting parents, caregivers, professionals, and policymakers in practicing the art and science of nurturing children. Every child is wanted, welcomed, loved, and valued. Every family is prepared for and supported in practicing the art and science of nurturing children. Adults respect children and honor childhood. Children joyfully participate in the vital life of family and community. Dynamic, resilient, life-honoring cultures flourish. At the heart of aTLC are our Proclamation and evidence-linked Blueprint of Principles and Actions. These documents synthesize age-old wisdom and leading scientific research supporting optimal human development from preconception through early childhood. An interdisciplinary group of experts and parents volunteered more than 10,000 hours of dedicated, consensus-based collaboration to create these living documents. We invite you to join us in honoring and celebrating children everywhere. Together, we can transform the quality of their lives, the lives of their families, and the wellbeing of their communities. a new book by Pam Leo. 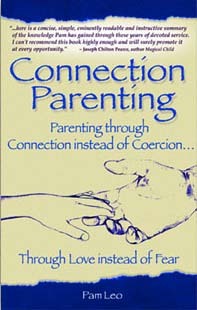 Listen to Pam describing connection parenting.